To tackle a spider web drawing, I found out that you need to be fairly confident about managing straight lines freehand. If you want to use a ruler, go ahead, there are no binding rules with our pencil drawing hobby but I have to say it's not as much fun! I actually like the challenge of creating an image on my own. 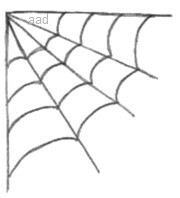 If you love drawing cartoons, this corner web here would be just the thing to use in them. Before I started these drawings of spider webs, I remember thinking that this would be an excellent subject for beginners... well, that was a wrong assumption! I soon discovered that drawing a spider web isn't as easy as it looks. However, once I got the hang of it and after a little practice, they turned out ok.
Spiders are small animals known as arachnids, they are not insects. They have 8 legs and they spin silk. We all relate spiders to the webs they create and these webs are used to catch insects for food. Not all spiders rely on their webs though - some chase their prey and some lie in wait, then pounce. The spider stuns or kills the prey with a poisonous bite. All spiders have poison, but luckily not all spiders can hurt people with their bite. Cobwebs are old webs covered in dust and dirt -- that means that they are uninhabited. I used to think that cobwebs and spiderwebs were the same thing but we live and learn. It's interesting that the silk of a web can't be dissolved in water, making it quite a tough little fibre. Tip: To create the drawing above, I ended up turning the paper around and around. By doing that, I was able to keep the threads together neatly. 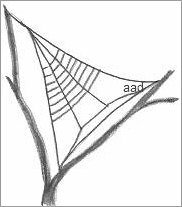 Once I have more experience with my spider web drawing, I shouldn't need to do this but if it helped me, I figure it could help you to know this, too. My favorite pencil of choice is a mechanical pencil and it was ideal for fine web drawing. Spiders leave a silk thread behind them wherever they go and this is called a dragline. The spider uses the dragline to escape from enemies. So, whenever you see a spider hanging down from his web, he must be feeling threatened by something. Maybe you? The dragline looks great in a drawing so there is no need to draw a pesky web. Always look for the positives, hey? Because there are at least 30,000 known types of spiders, they all spin different types of webs and some are quite messy looking. 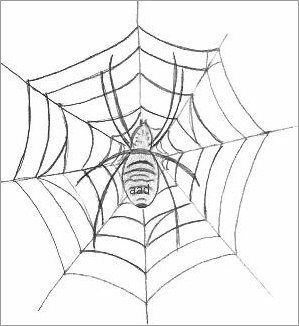 I did try to draw one that is spun by a common house spider but it looked like a very poor attempt at a spider web drawing. I decided not to show you that one (chicken). Spiderwebs come in all sorts of shapes and sizes and being the artist, it's your decision how you portray them. 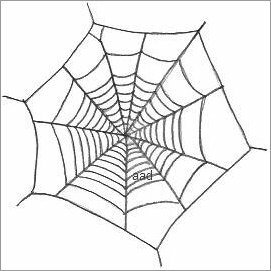 The drawings of spider webs that I did here are what I think a web generally looks like. To draw the spider in the web, I decided to draw the spider first, because it is more detailed than the web itself. 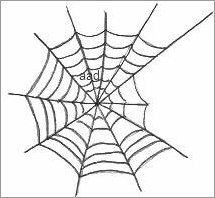 Then I drew the web around the spider and this helped me achieve the result I was after. 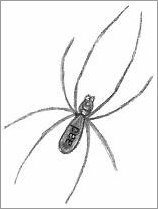 Unfortunately, (in hinsight) the illustration is out of proportion because the spider is way too big on that small web. At the time I drew all of these images, I have been teaching myself to draw for about thirteen months. I was quite surprised when I started the first spider web drawing, it turned out to be a real messy piece of work! Being a resolute person, I don't give up easy so I drew a lot of webs until I was satisfied. It is a tricky job linking up the threads and spacing them to appear realistic. We also have to consider that some spiders take pride in their homes! If you are seeking ideas for drawing spider webs, take a look around outside to see if you can spot a good looking one. 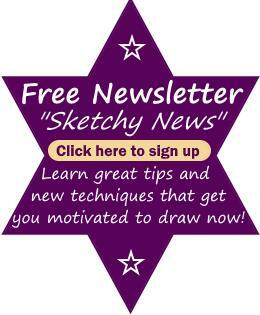 Do a quick, rough sketch outside then transfer it once you have a firm surface to draw upon. After a bit of practice, spider web drawings were easy enough. That doesn't mean they are hard for everyone to draw, it only means that I had a bit of trouble initially. This spider web drawing in a tree looks quite attractive and reminds me of a sailboat. The straighter kind of lines were probably the hardest part of my spiderweb drawings and if I give any advice, it is to make the lines nice and dark so you don't have to go back over them and likely ruin the piece. Overall, I enjoyed the experience so I hope you also have fun with these spiderwebs!